medTEAtation:- a pause button in our life. All through the ages, sharing and drinking tea together has been appreciated as a restorative, meditative, and calming experience. In a medTEAtation circle, we sit silently and brew tea which we pass to our neighbours, in a simple ritual that embodies the qualities of beauty, equality and harmony. It is like being part of an Impressionist painting, with each person acting separately as an individual yet, taken as a whole, forming a beautiful, living, moving tableau. MedTEAtation costs £8 per person which includes a 20g packet of seasonal tea (worth £7 – £8) for you to take home. You will need some basic tea making utensils (see list here). We can also supplement some of these utensils. Please indicate the specific items when you pay for the ticket. 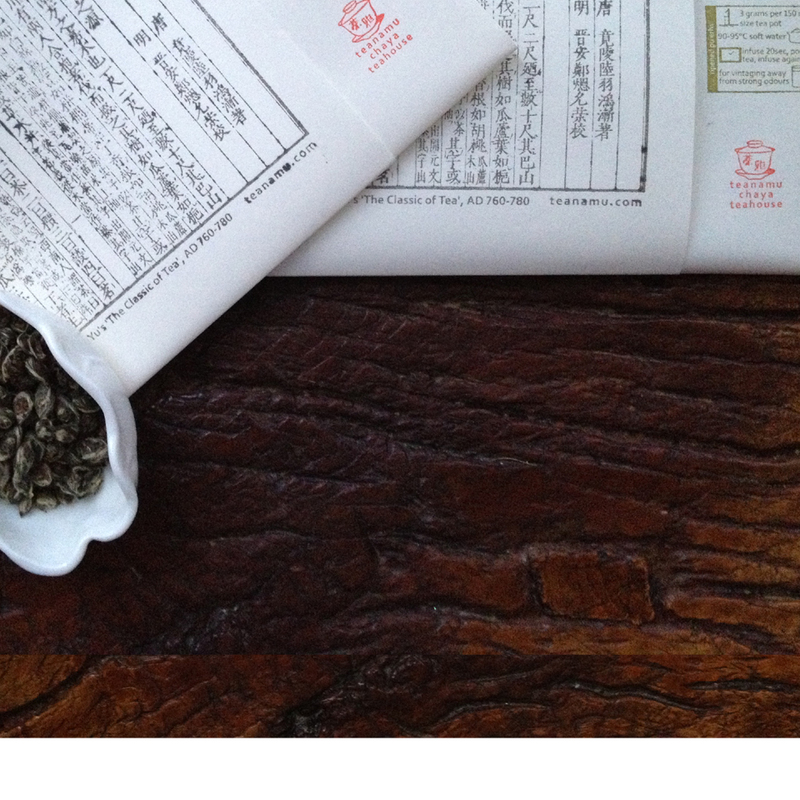 The concept of medTEAtation is a collaborative, harmonious meditation over tea. You sit in a circle and perform your own silent tea ritual. The object is to make 4 cups of tea, one for each of your 3 neighbours to the left plus a cup for yourself. In turn you receive 3 cups of tea from your 3 neighbours to your right. The ritual is repeated silently 3 or 4 times, as further infusions of tea are brewed. The circle may comprise any number of participants, from 3 or 4 up to a thousand! 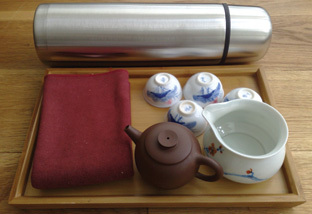 We pay respectful homage to the origins of medTEAtation in the Wu Wo Tea Ceremony devised by our honoured teacher Prof. Tsai Rong Tsang, Dean of Tea Culture at TenFu Tea Institute in Fujian Province, China. Wu (无)means ‘nothingness’, ‘absence’, ‘void’, ’empty’ and ‘infinite’. Wo (我) means ‘I’, ‘self’ or ‘being’. Together, these characters signify ‘being without attachment’. The emphasis in medTEAtation is on simplicity, frugality, appreciation of natural beauty and creativity. A minimum of structure is pre-planned, within which you each brew and serve tea in your own way at your own pace yet moving with the whole group toward the same goal and together appreciating the same principles of equality, simplicity and harmony. In experiencing the restorative benefits of complete silence, while brewing and serving a natural, healthy pot of tea in a harmonious and beautiful group setting, you’ll find a graciousness that is rare and hard to express. Prof. Tsang has likened the effect to natural phenomena such as the rainbow, where different colours combine to form a brilliant light, as well as the inexorable changing of the seasons. We will inform you of exact venue, date and timings. Fill your thermos with boiling water and put your dry tea leaves into your teapot. Check in with us when you arrive. Lots will be drawn to allocate your position in the circle. Find your position and set up your tea equipment. Spend a little time appreciating other participants’ tea set-ups. At the appointed time, return to your position and brew your first pot. Place 4 cups on your serving tray, fill them with tea and go serve 3 of them to your left as shown in the illustration below, bringing back the 4th for yourself. Returning to your position, you’ll receive 3 cups from your right (your ‘right’ neighbours may already have served you while you were serving your ‘left’ neighbours). Acknowledge each person with a silent smile, nod or bow. Wait for all 4 cups to be in front of you and then in peaceful silence enjoy the 4 teas each made slightly differently by different hands. After drinking all 4 cups, make a 2nd infusion by adding hot water to your pot. For the 2nd and any subsequent infusions, pour the tea that you’ve just made into your pitcher, so that you can go serve your 3 left-hand neighbours from the pitcher directly into the 3 cups that you’ve already passed to them (no need to use a serving tray this time unless you want to). To close, spend a few minutes reflecting silently on the experience, clean the 3 cups that you’ve received from your right side, then go collect your 3 cups from your left, using your serving tray. Clean, dry and pack up your equipment and leave quietly refreshed. While the tea set up mentioned below is based on the Chinese Gongfu Cha tea ceremony, you could choose to do other types of tea ceremony. The important thing is that you make the best cup of tea you can and that you enjoy the restorative benefit of medTEAtation. * Asterisked items are essentials, but be creative! For example, a little milk jug could serve as a pitcher and egg cups could work quite well as small tea cups!